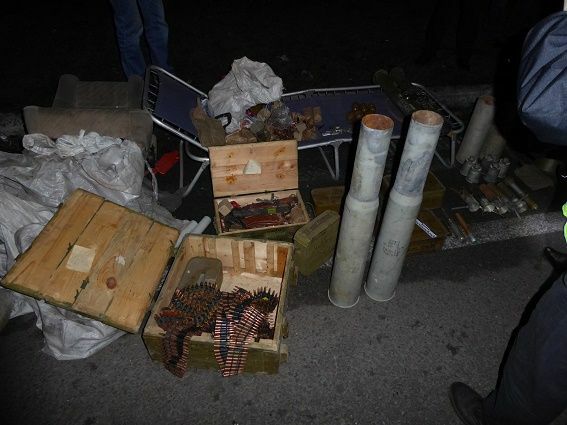 A 50-year-old driver has been detained in Kyiv after patrol police revealed two grenade launchers, grenades, and boxes full of cartridges in his van during a routine inspection, the Kyiv PD press service has told UNIAN. Law enforcers stopped a Ford Transit minivan after it was seen driving with its headlights off in the night time, the press service reported. "We inspected the vehicle and revealed two grenade launchers, several thousand rounds of various calibers packed in metal and wooden boxes. There were also six cartridges, and two knives, six grenades and fuses to them," said Andriy Krishchenko, Kyiv PD chief. In addition, the police say they found 40 items similar to VOG-25 underbarrel grenades. Read alsoCache with weapons, ammo discovered near KyivIn a subsequent search at the driver’s home, the law enforcers found and confiscated several hundred rounds. The man explained that he had brought the ammo from the zone of the Anti-Terrorist Operation, where he said he had previously served in a volunteer battalion. He had reportedly kept the arsenal in his garage before deciding to transport it for further storage to the countryside in the neighboring region. The driver has been detained as criminal proceedings have been initiated under Article 263 of the Criminal Code of Ukraine (illegal handling of weapons, ammunition or explosives).